The opening lines in the stories of companies like Enron, Global Crossing, WorldCom and dozens of others all begin with the same name, writes Frank Partnoy. In 1984, Sanskrit scholar turned Wharton graduate Andy Krieger began trading currency options at Salomon Brothers. Although his career ended in ignominy just a few short years later, Krieger was the "Patient Zero" in the virus that infected Wall Street and financial markets around the world. The infection was a cavalier disregard for everything except meeting or exceeding profit expectations and the end of the year bonus, Wall Street's ultimate measuring stick. 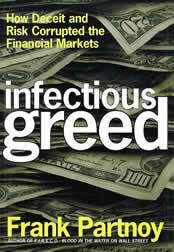 It's this world that Partnoy investigates in Infectious Greed: How deceit and risk corrupted the financial markets, a chronicle of how the seeds for the corporate failures grew over time. Partnoy argues that Wall Street developed increasingly sophisticated financial instruments, nearly all based on derivatives, to allow corporations to hide their blemishes and avoid government regulations that would have been triggered by more traditional financial instruments. When combined with accounting fraud, conflicts of interest, a lack of diligence by everyone and Alan Greenspan's "irrational exuberance," the result was a financial world that began to spin out of control. "In just a few years, regulators had lost what limited control they had over market intermediaries, market intermediaries had lost what limited control over corporate managers, and corporate managers had lost what limited control they had over employees. This loss-of-control daisy chain had led to exponential risk-taking at many companies, largely hidden from public view. Simply put, the appearance of control in financial markets was a fiction," writes Partnoy. Infectious Greed is part-investigative report, part-economics lesson presented in a readable manner that takes the reader along on a ride of irrational greed built on a foundation of fraud and duplicity. Partnoy manages to translate the most complicated schemes into easily understood ideas in his engaging story. All of the era's major figures come to life in his narrative and while he's clearly disgusted with many of their actions he also manages to be fair to them when it's called for. As he points out, many of the activities they engaged in were arguably immoral and unethical, but many times it was hard to argue that they were clearly illegal. Money, like water, likes to take the route of less resistance and many of the complicated financial schemes used to play the massive shell games of the 1990s were designed to avoid regulated activities. Plainly put, they charted new courses that often weren't covered by existing laws. It doesn't excuse some of the reprehensible things people did, but it does certainly explain why they happened. Most people would like to forget the implosion of the stock markets and the resulting hangover but Partnoy argues that this story is far from over. The increasing complexity of derivative-based financial instruments shows no signs of slowing and that leaves the world economy in a dangerous position. Whether supervised or not, a single trader is capable of significant impacts on the market, as Krieger did when he shorted roughly the entire money supply of New Zealand in one infamous episode. Whether his prescription for alleviating the problems these new instruments have solved are realistic will be for the reader to decide but his final point is beyond debate: many of us played a role in creating the problem and it will be up to us to hold ourselves and the corporate world to a higher standard in the future. Steven Martinovich is a freelance writer in Sudbury, Ontario.